Finally, one of the biggest promises of the last few months has been fulfilled: Upgradable gear has arrived. No longer are we at the wimps of luck or mithril…now, we can start upgrading our own gear and make the best gear combinations possible. 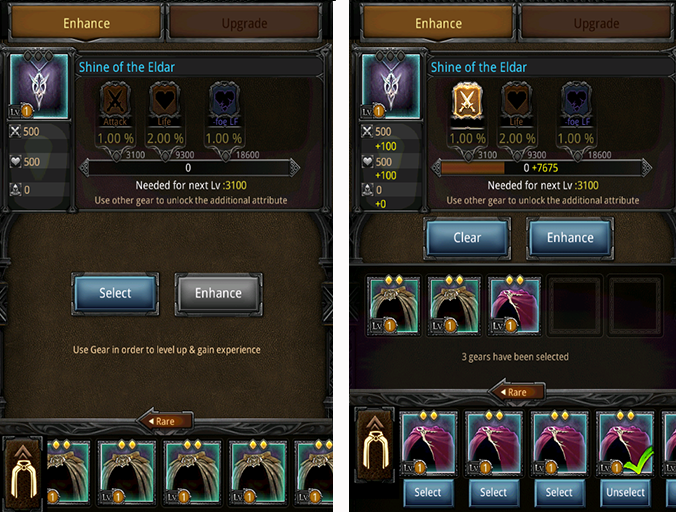 In this article, I will try to combine all possible information on upgrading and enhancing your gear pieces. Like always, if I learn stuff later on, I’ll add it to the article. Two new buttons have appeared, “Enhance” and “Upgrade”. So what do they do? Well, basically, Enhancing gear means you unlock bonus attributes on pieces of gear that still have locked attributes. For gear we have gotten up until now, all bonus attributes have been unlocked, like life bonus on Ent gear or T4 attack bonus on Havoc, so this will only work with new gear that started dropping from the introduction of this feature. The necklace above was a gift for Kabam to start playing with gear upgrading and serves as a good example. 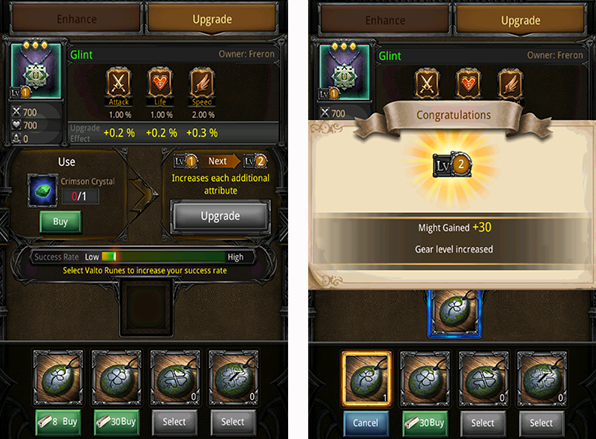 The other option, Upgrading, means you improve on the existing bonus attributes of a gear piece. Contrary to Enhancing, this can be done on any piece of gear. Now, how does this work? So, Enhancing gear means unlocking locked bonus attributes on new pieces of gear. The Ancients of the Eldar set is a new set that can be Upgraded as well as Enhanced. Lets press the Enhance button, which brings us in the Enhance screen. Enhancing gear is done by sacrificing other gear. By pressing select, you are able to go through your gear and select which pieces you can sacrifice to upgrade the item in question. If you look to the top right on the screen, you see a bar, with the unlockable bonus attributes from left to right. The point is to fill the bar to the required level by sacrificing gear: each piece of gear you select gives a number of points, the higher the gear, the more points. Once you press Enhance, the selected gear is destroyed and the piece in question is Enhanced. If you were able to reach a certain level, that level’s attribute is now permanently unlocked for that gear piece. Congrats! 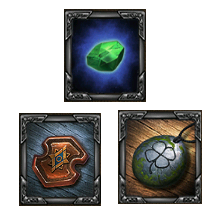 New items for enhancing gear has been introduced in the form of Mystic EXP Charms I, II, III and IV. They are a bit weird, in that they are basically gear (with low stats and no attributes though), that can be sacrificed for enhancing gear, instead of using gear (per the description). They even show up normally in the Ring selection of Hero gear and you can even equip them! Anyways, just use them for enhancing gear, for which Charm I gives 1.800 XP, Charm II gives 3.000 XP, Charm III gives 6.000 XP, and Charm IV gives 10.000 XP, which are great amounts. They’re won from chests and such, but don’t drop anywhere to be farmed yet as far as I know. Gear can be upgraded to level 10. On the top right of the screen, you can see the effect the next level has on the bonus attributes. To the lower left we see the Crimson Crystals. These are the ingredients you need to upgrade gear, at least for the lower levels, and you will need increasingly more of them. When you have enough to upgrade, you can press the ‘Upgrade’ button to have a chance at upgrading your gear piece. The chance aspect is where the next items come into play. Below the Crimson Crystals, you see the ‘Success rate bar’. Having enough Crystals does NOT mean you will upgrade your gear, it only gives a chance, denoted by the bar. When you do nothing and just upgrade, the chance of upgrading is really small. At the bottom, you see which Valto runes you have in your possession. These runes temporarily increase the chance of successfully upgrading. The runes come in different flavors, each with increasing effects. The normal Common Valto runes are enough for the lower levels of upgrading (up to level 3). The Rare Valto rune is needed for larger bonus effects for higher levels of upgrading. From level 3 onward, the common stones do not fill the entire bar anymore, so the chance of a failed upgrade increases. The Epic Valto rune gives an even bigger boost to your chances, and is needed for the highest levels of upgrading. They are so far notoriously difficult to come by, and do not drop in campaign maps as far as I have seen. Just make sure not to waste Crystals on upgrading without these. If you’re out and really need them, the Common and Rare runes can be bought for 8 and 30 mithril respectively. Getting a hold of the Epic and Legendary ones is gonna take a while. I will cover these and other Alliance trading subjects in a later post, when more features and information are given. Keeping this info here right now because the Stones do drop together with the Crystals and Valto’s. So we need Crystals for upgrading, and Vala stones for increasing our chances of successfully upgrading a gear piece. But where do you get these items? For one, they can be bought in the shop in certain chests. They aren’t cheap though so expect to spend some mithril if you want to upgrade a lot of gear. Probably the best way to acquire them is through defeating Alliance Bosses. Yes, finally they have some real use. The prize chests for defeating Alliance Bosses have been enhanced to include the Crystals, Stones and even new pieces of gear. But remember, the higher the Alliance boss level, the better the drops from the chest. Dont expect anything spectacular from Advanced Forrest I chests…. Some of the items can also be farmed from campaign. Crystals, Valto Runes and Amber Stones all drop in since the last update. They can be found in the campaign chapters High Pass, Mirkwood and Moria. Seems Mirkwood and High Pass drop Crystals and common Valto Runes, while Moria drops rare Valto Runes occasionally. Lastly, expect these items to be prizes in upcoming events and tournaments. 4. What sets to upgrade? With the addition of newer and better sets constantly, I have removed the set specific information on all articles, and instead made one post with the best sets in-game that I keep up to date. Go to that article to decide which sets you have that should be upgraded. This entry was posted in Articles, General and tagged Alliance, amber stone of vala, ancients of the eldar, campaign, common, crimson crystal, eldar gear, enhancing, ent gear, farming, forge, gear, Great hall, havoc, Hero, kabam, kingdoms of middle earth, rare, stone of vala, upgrading, valto rune by beardmonkey. Bookmark the permalink. What does might gained actually refer to when upgrading equipment? Wartorn is a total attack gear, raising all troop attack ratings. Especially t3 and t4 troops. Ent gear is still the best for defense and Campaign. Void gear should be the best for defense, but in a test with me reinforcing a wild Ent gear defended better. My only guess on this is that Kabam has not yet gotten the battle code correct for this gear. Sounds like a 4 goes from 4 to 5. You need a 3 to upgrade from 3 to 4. When combining different gear, should we be looking at the combined attack and defence rather than just life for defence and attack strength for attack, eg is total life/attack stats at 3000/5000 more superior than one that is 6000/1000. Does that matter for attack or defence? Are attack and life de-buffs only good for defence or both as well? Thanks. Feel free to not approve this comment, but just to let you know I moderate necroRmation.wordpress.com and keep it vastly up to date, while running with a heavy tk crowd. Feel free to check there for lots of stuff, as I update it at least once a week with current info. The only edit coming to mind atm that needs doing is specifying specialized gear sets for attacking and how they measure up against 4/5 ent with void ring, all at level 10.
the third valto rune is to upgrade to level 10, and the fourth is for specific levels… theres a number of the valto runes in fourth category… if you get level 4, it means it gives you a 100% chance upgrading gear from level 4 to 5… goes all the way up to 8 i think, since the epic valto rune is for level 9 to 10. There is legendary Valto 9 which gives 100% chance to upgrading from 9 to 10.common valto,rare valto and epic valto only increasing chance for upgrading to another level.Epic needed for higher upgrade. Highest level is 10. Was able to upgrade my ent shield to this. Which one is good to upgrade ancient gear set or havoc set or Orc gear set or filthy few or pilifered for attacking others city and for defending ur city ? Each amber stone of vala that is entrusted to your alliance is 1 alliance point and 1 loyalty point… Just from what I know. Amber stones of vala are actually for your alliance. You entrust them to your alliance to help your alliance level up. Not sure what youre asking for. For Enhancing Prisoner doesnt have good basic bonus attributes, so only upgrade if you find pieces with 2x life bonus or something. Otherwise, use them to upgrade gear that IS suited.